The European clubs rarely look forward to it, for the tournament sees many forced to release key players slap bang in the middle of a season, but there’s plenty of reason to get excited about the Africa Cup of Nations from a neutral’s perspective. The competition is now in its 30th edition, since starting in 1957, and offers a decent alternative to the football that Premier League fans are used to. There has been a surge in interest in AFCON across the globe in recent years, partly due to the fast and furious end-to-end displays, and also because no team can ever feel assured of victory. As an indication of just how open the competition is; the last four finals have been contested by seven different nations – a far-cry from the monopolies we’re used to in other international tournaments. Nigeria, the champions of the last tournament in 2013, haven’t even qualified for this edition. There were major doubts the tournament would go ahead after slated hosts Morocco pulled out due to a health scare around the Ebola outbreak, but Equatorial Guinea have stepped up to the plate, and the first game will kick off this Saturday. Sporting Index have made Ivory Coast favourites in their 50 outright index (winner: 50, runner-up: 30, semi-finalist: 20, quarter-finalist: 10), with a spread of 19-22. That’s understandable, given the wealth of talent at their disposal, including the likes of Yaya Toure, Gervinho and Wilfried Bony, but Les Elephants haven’t lifted the trophy since their only triumph back in 1992. That being said, they’ve at least reached the quarter-finals in each of their last five tournaments, finishing in the top four on three of those occasions. Algeria’s strong showing at last summer’s World Cup certainly turned a few heads, taking eventual winners Germany down to the wire in the knockout rounds. Ghana will field a fair few faces familiar to European fans, including Asamoah Gyan, Emmanuel Agyemang-Badu and Andre Ayew, however the Black Stars have been drawn into a difficult Group C, alongside Algeria, Senegal and South Africa. Bafana Bafana topped a qualification group containing Nigeria, consigning the reigning champs to a play-off. Cameroon will have to deal without Samuel Eto’o, the competition’s all time highest goalscorer (14 goals), for the first time in decades. No longer able to boast the depth in quality we’d become accustomed to, and drawn into a tricky group containing Ivory Coast, Mali and Guinea. Sports spread betting experts Sporting Index price up 150+ markets on football matches alone. The sheer scale of opportunities for spread bettors is unsurpassed anywhere. All these markets are updated in-play allowing the ability to react to the game’s action in the blink of an eye. 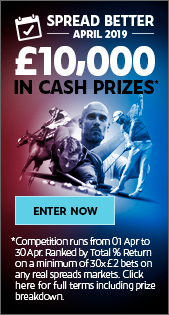 The pioneering Cash Out option means bettors can close a trade in-play; securing a profit or securing a loss. 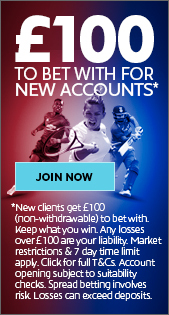 Sign up online today and get a fantastic new account offer.